Here is a trend analysis of GIDEP Alerts and Problem Advisories concerning suspect counterfeits. The last time I published an analysis like this was in February of 2014[i] and its time for an update; particularly since we can anticipate FAR Case 2013-002 to wrap up this summer (Reporting of Nonconforming Items to the Government-Industry Data Exchange Program). 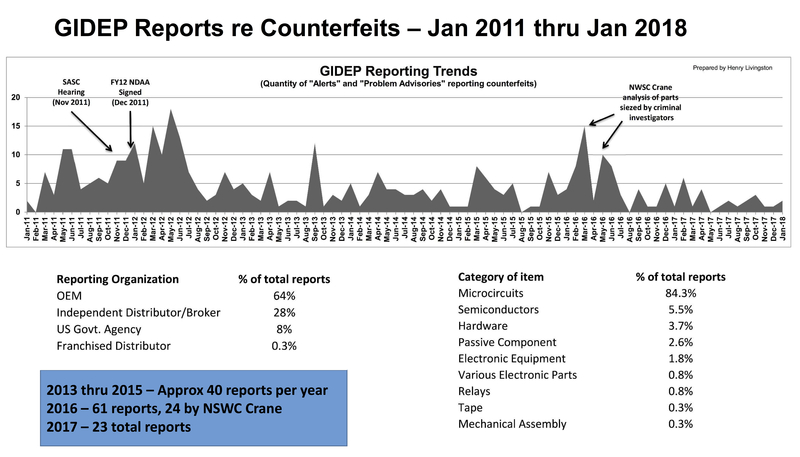 To my eye, this data indicates a continuing decline in GIDEP reporting of suspect counterfeit findings. From 2013 through 2015, approximately forty (40) reports were published each year. Though sixty-one (61) reports were published in 2016, twenty-four (24) of them reporting the results of forensic analysis of several parts seized during a criminal investigation; if we remove these 24 reports from the population, that leaves 37 for the year 2016 which falls below the trend from 2013 through 2015. In 2017, the total number of reports fell to nearly half that of prior years. GIDEP reports concerning suspect counterfeit microcircuits and semiconductors represent about 90% of findings reported over the 2011 through 2017 timeframe. However, reports concerning other products types are on the rise. Original Equipment Manufacturers have published about two-thirds of the GIDEP Alerts and Problem Advisories concerning suspect counterfeits. Independent Distributors published 28% of these reports. US Government Agencies (four of them) published 8% of these reports. One report was published by a Franchised Distributor.